Forgive me for my lack of posts:). Don't know why I feel the need to apologize, but there you have it. You see, I'm a researcher by nature. I LOVE learning, growing, challenging the way I think, and moving forward. Frankly, these past two weeks have been so hard, but so good. There is a lot churning around in this brain of mine. The Lord is challenging me like never before in the way I think, eat, and just plain ole' do life. I want this blog to be real. A place that I can put whatever is stirring within me into words. Well, I haven’t had the words a lot of times these past few weeks. I’ve tried to put lots of this digging into words only to have written a sizeable novel by the time I’m done with it. Geez! Who wants to read that?? I get overwhelmed at the amount of information that is flooding my life- some God stuff, some good stuff, some downright awful stuff, some homesteading stuff, some false stuff, some sad stuff, some school stuff, some health stuff. All of this “stuff” causes me to dig really deep in the things that are competing for my attention. I've discarded the things that don't matter and am clinging to the things that really truly do matter. That, my friend, is freeing! But, every time I’ve sat down to write (and there have been many....you should see the posts that have began but not yet posted), I can sense the Lord just wanting me to “rest” in it for a while and let it truly sink in. He wants me to put into action the revelation and words He is breathing into me. My desire is to bring glory to God in everything I do. One thing is for certain....He is my Rock, my Fortress, my stronghold. Time is fleeting. Each day that goes by is one day closer to seeing the King of Kings- whether He comes back at any time or we go see Him. I recently purchased Farmer Jason some Frogg Toggs for a gift. He totally LOVES them and would recommend them as a gift for any man that is outdoors quite often whether it be for work or for recreation. They come in a variety of colors (including cammoflauge for the hunters out there). They are rain proof and windproof suits made from lightweight waterproof fabric. What we love about these is that they can be worn together as a suit or individually. Jason wears the jacket a whole lot. Another thing we love about them is that this whole suit costs less than $100 (much less). If you are searching for a gift for an outdoors loving guy, this would be perfect! I purchased mine locally at Academy but you can get them at Cabela's or Gander Mtn. as well. Something I'm LOVING these days is my Kindle. A Kindle is a wireless reading device that is purchased through amazon.com. 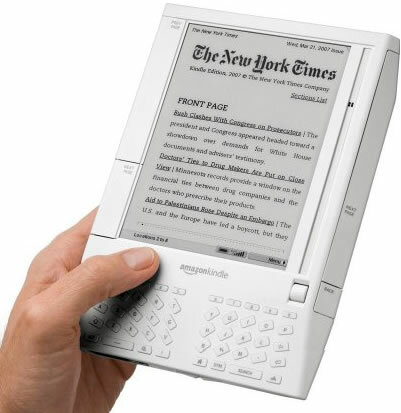 This wonder machine stores up to 1,500 books, is lighter than a typical paperback, and can go anywhere with you. The prices to purchase your books on Kindle are also much cheaper than buying a hardcopy of the book. The Kindle would be a perfect gift for the avid reader in your family. This has came in so handing as many hours of my day are spent rocking and nursing in a chair holding little Ruthie Claire. I've developed an extreme love for reading over these past few years and have read more books because of this! I have a small house and LOVE to look of books thrown into the decor, but I haven't the space for the volume that I go through. However, let me say that any book that has a "How To" skill that will come in handy if something happens to go way wrong in America and we loose power for a good length of time or never regain power (hypothetically speaking....not going to even cross that bridge right now), I buy the hard copy. The pictures aren't that great on Kindle either so anything that is photo intensive wouldn't be good to purchase on Kindle either. I saw this on a friends blog (thanks Shauna:). I wanted to post it here for you guys and gals to see this insanity. It takes about a minute to watch. I posted this below on our farm blog/website. However, I felt it was worth posting here too! I should be posting regularly again on my blog. I've figured out (not technically me, but my genius bro in law....thanks Aaron!!) why my Internet was less than poor here. There was an article in The Houston Chronicle yesterday about commercially raised beef. The article focuses in on the slaughterhouse practices in factory farming. Butcherers of large meat producing plants grind up various undesirable parts of the cow (instead of whole cuts) and can use multiple cows from different slaughterhouses to make up their hamburger meat. This particular article spotlights a young woman who thought she was purchasing top quality meat labeled "American Chef's Selection Angus Beef Patties" and paid a premium price for the meat only to be stricken with E. coli and paralyzed from this deadly food-borne illness. With many recent food borne related illnesses and recalls in the news, I feel its important to pay attention since the government does not have our best interest at hand when it comes to food that are commercially sold and processed. Instead, the FDA and USDA are trying to crack down on small farmers by trying to pass certain legislation (read this article here) instead of tackling the bigger of the two beasts. I feel this is nothing other than an attempt to look as though they are "handling things" in regards to food. When in reality, most small farmers that we know exceed all government standards and regulations. The article gives insight into the awful practices of the commercial meat industry and how the USDA is doing virtually nothing to combat the problem of the spread of E. coli throughout the commercial meat industry. This quote is taken directly from the article. "In August 2008, the USDA issued a draft guideline again urging, but not ordering, processors to test ingredients before grinding. Dr. Kenneth Petersen, an assistant administrator with the department's Food Safety and Inspection Service, said the department could mandate testing, but that it needed to consider the impact on companies as well as consumers. “I have to look at the entire industry, not just what is best for public health,” Petersen said." 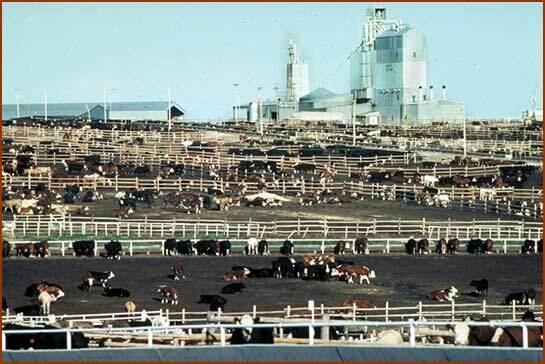 Another feedlot. "Hey Edna Earl....where is the grass??" Scary, huh???? The "not just what is best for public health" part doesn't sit right with me. As a small farmer, our biggest consideration in raising food is always the consumer and their health. Always. We have structured our entire farming practices with that very notion. The article makes a case to buy from local farms without even directly stating it. I don't even think its intent was to promote small farms. By simply stating facts, its obvious that consuming factory farmed and slaughterhouse butchered meat is not in our best interest. Our farm is very particular in who we use to butcher our meats. We have established a wonderful relationship with a local small butcherer to ensure that we receive only our cows. Our cows are never held in a slaughterhouse. They go straight from our pasture and are slaughtered right when they arrive at the butcherer. On the days our cows are butchered, we go to great lengths to make sure that our cows are butchered first before any other meats. The hamburger meat that we sell contains none of the "junk meat" that you would receive from commercial hamburget meat. We use on whole cuts of beef and then have our butcherer grind them up. Its a bit more costly to it this way since you are most likely grinding up what could be roasts and steaks. However, we prefer to do it this way over using less than desirable cuts of meats that the factory slaughterhouses would use to cut corners and save a buck. If the USDA won't look out for our best interest, then we have to take it upon ourselves to do so. Factory farming is not the answer. You DO have a choice. To find a farm near you who has good farming practices you can visit http://www.eatwild.com/. To view the article in the Chronicle, CLICK HERE. 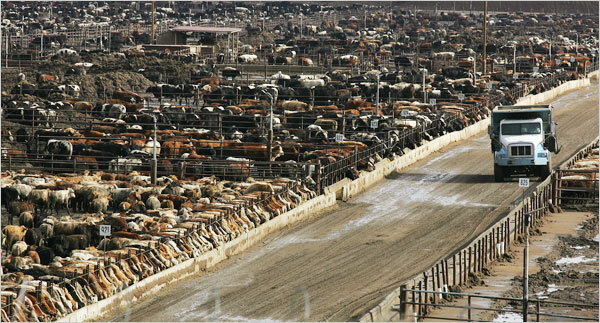 Graphic yet telling, a commercial slaughterhouse pictured below. Its no wonder various cows and cow parts are getting mixed up in the ground beef. Jason's uncle passed away last Friday morning. This uncle, Uncle Durward, lived on the farm with us and his sweet wife Aunt Debbie. Over the last few years, we have grown extremely close to them since we have lived life alongside them. He passed away in their home with all of us around him. We prayed many prayers and cried many tears as we watched him slip away from this earth and into the Kingdom of Heaven last Friday. We felt the presence of the Holy Spirit right there with us each step of the way. It was one of the most beautiful and most difficult things I've witnessed. Aunt Debbie was truly by his side "till death us do part." I've learned so much from watching her serve him through this entire battle with cancer. She is an amazing woman and I'm blessed to have her as such a huge part of my life. We will miss Uncle D so much. Kaylyn, our oldest, has cried many tears- as we all have. She summed it up at the funeral by saying these words behind her tears,"Mommy, I'm glad he is in heaven. But, I'm going to miss him." That is so true my sweet one. We KNOW where he is. Death is hard and inevitable. One of the things that the pastor of the funeral said that resonated so beautifully in my heart was,"Let death be a teacher to you." Jason's sister wrote about this too. Her words are beautiful. Death can be used to show us whether we belong to Christ or not. We have confidence that Uncle Durward knew Jesus and sought after him throughout his life. This makes the journey of death a little less heavy because we KNOW where he is. The body we saw shortly after he made his exit from this world was but an empty shell. We are going to miss so many things, Uncle D.
Apple fritters and Dr. Pepper for breakfast:). The sound of your pick-up truck driving up and down the driveway as you came and went on your many journeys to church, to serve, to help. You knocking on my door just to hold one of my babies. Watching you model before us one of the most GENEROUS hearts we've ever witnessed. We love you so much and will miss you.